The DEP and OEM announced that NYC’s official notification system will now issue rain-related advisories on 25 waterbodies in the area. The organization's chair says the goal is make Ontario, CN "the place where the world buys its water management technology." Only a month after Hurricane Isaac swept past the city, the largest annual water quality conference will bring an estimated 18,000 attendees to the downtown Morial Convention Center. 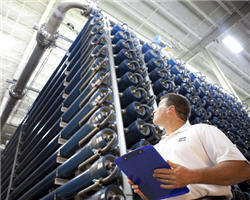 Mike Matichich and colleagues looked at five thirsty industrial sectors, including oil & gas, chemicals, and semiconductors, to understand how water and wastewater costs are affecting business decisions. Biological treatment plus ozone can reduce the amount of sludge coming from wastewater treatment plants by a factor of ten. Permits call for major reductions in phosphorus; new limits on mercury, ammonia and temperature. The Groundwater Replenishment System expands its capacity to purify wastewater. Before wastewater reaches recipient waters, nutrients must be removed in order to avoid eutrophication and large algal blooms, which may result in serious damage to animal and plant life. 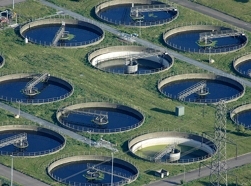 Robert Almstrand at the Depertment of Chemistry and Molecular Biology at the University of Gothenburg, Sweden, has shown in his thesis that better removal of nitrogen from wastewater can be achieved by providing the bacteria that purify the water with alternating high and low levels of nutrients. As the world population grows, the struggle to provide enough resources to people becomes paramount. Whether it is having access to a resource or having enough of it, nations will fight to gain control of supply. Of those resources, one of the most vital is water. With recent advances in technology and design, treating municipal wastewater and reusing it for drinking water, irrigation, industry and other applications could significantly increase the nation's total available water resources, particularly in coastal areas facing water shortages, says a new report from the National Research Council. Despite having an eight-year head start on Marcellus Shale natural gas extraction, Pennsylvania residents are just as uncertain about the effects of horizontal hydraulic drilling as New Yorkers, researchers at Cornell and Penn State have found. A Michigan State University (MSU) researcher is using a $1.92 million Department of Defense grant to develop a portable wastewater treatment system that could improve the military's efficiency. A new study reveals that the release of treated municipal wastewater – even wastewater treated by the highest-quality treatment technology – can have a significant effect on the quantities of antibiotic-resistant bacteria, often referred to as "superbacteria," in surface waters. A national database on technologies to assess the conditions and rehabilitation of the underground pipes will be available to utilities and the general public, starting on Thursday, Sept. 1.